Awards - Shanti Leprahilfe Dortmund e.V. "Peace Women across the Globe" is a global network of the 1000 women who were nominated for the Nobel Peace Prize in 2005. Marianne Großpietsch is one of them. 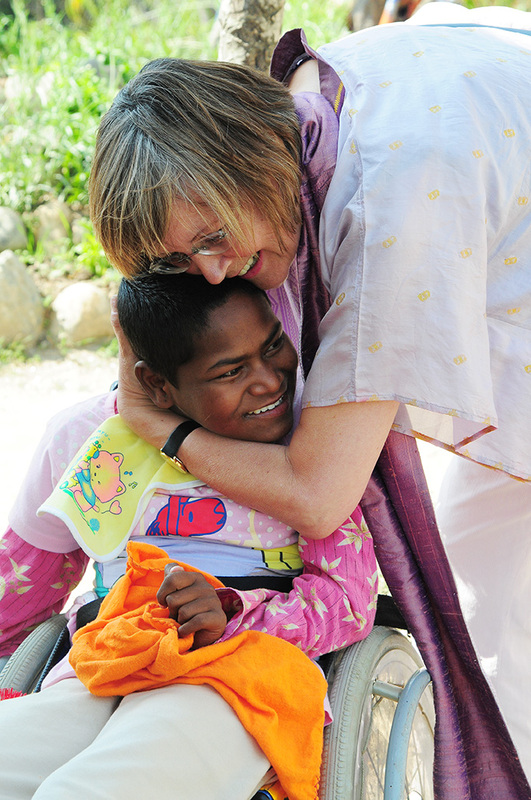 Marianne Großpietsch lovingly greets one of the disabled children receiving care in Budhanilkhanta. At the end of January 2005, the Nobel Peace Prize committee in Oslo received nominations for 1,000 women as part of the “1,000 Women for the Nobel Peace Prize 2005” project. Marianne Großpietsch was one of the nominees for her work with Shanti Leprahilfe Dortmund e.V. On 29 March 2006, Marianne Großpietsch received the Cross of the Order of Merit of the Federal Republic of Germany. The newspaper Westfälische Rundschau wrote about this as follows: “High-ranking awards for four residents of Dortmund: Federal President Horst Köhler bestowed the Cross of the Order of Merit of the Federal Republic of Germany to Marianne Großpietsch and Karl Heinz Sander, and the Medal of the Order of Merit of the Federal Republic of Germany to Heinrich Bettenhausen and Herbert Stoverock. Mayor Birgit Jörder presented these honours yesterday at the city hall. Marianne Großpietsch (62) gained award-worthy merit through her decades of engagement in the social and charitable sectors. Großpietsch has been advocating intensively for lepers in Nepal since the beginning of the 1970s. In order to intensify her efforts, in 1989 she founded the “Shanti Leprahilfe Dortmund e.V.” organisation and serves as its chairperson. In total, over 800 people have found refuge in the organisation's facilities. Marianne Großpietsch spends at least five months each year in Nepal. The seven months in Germany she spends fund-raising in order to keep the leprosy station running. This requires around € 30,000 each month.